Does your business align with The Junk Map's passion for salvage, reuse and recycling? Do we reach your target market? Would you like to extend your reach on social media? 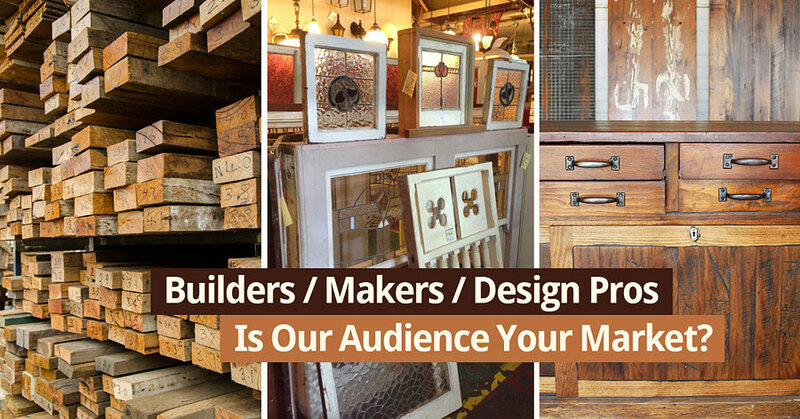 The Junk Map is a niche hub that attracts a creative audience of design professionals, home owners, renovators, builders and furniture makers. In 2017, just 44 junk-business profiles and supporting posts received 183,000 unique visitors and 475,000 page views. 60% of visitors were female. 70% of visitors were aged 25-54. We have 17,000+ Facebook fans, 4,000+ newsletter subscribers and retargeting options to reach our audience on multiple platforms. The Junk Map offers a limited number of website banners and sidebar ads. For the last year we have been doing a monthly Facebook promotion through The Junk Map. We have our studio and sculpture trail open on the first weekend of every month, and Junk Map runs a Facebook promotion for us in the week prior. It has been so effective that it easily accounts for at least 60% of the visitors we get through our studio on those weekends. There are many ways these promotions can be done, and a number of ways particular demographics can be targeted. Lara and the The Junk Map team are always fine tuning and actively testing how to get the best results. At the end of each promotion we are provided with accurate statistics on how the promotion unfolded. The Junk Map plays an integral part in our business, not just in our advertising but in our exposure through the website. They have been, and will continue to be, an important part in our growth and success. Getting your message in front of the right audience is the first step in effective marketing. If you think your business would be a good match for Junk Map advertising please get in touch below. NOTE: If you're interested in a profile of your business with photos and social media links, CLICK HERE FOR COSTS and information.